A spiny mouse from Israel's Negev Desert starts eating berries from the shrub Ochradenus baccatus (upper left). It soon spits seeds into its paws (upper right) and onto the ground (lower right and lower left). If the seeds were chewed at the same time as the fruit pulp, toxic chemicals would be released. So the plant has effectively turned the mouse from a seed-eater into a seed-spreader to help the plant reproduce, according to a new study from the Technion-Israel Institute of Technology, University of Utah and other institutions. Credit: Michal Samuni-Blank, Technion-Israel Institute of Technology. The study illustrates the first known case within a single species of what is known as the "directed deterrence" hypothesis, namely, "the fruit is trying have itself eaten by the right consumer  one that will spread its seeds," Dearing says. "The plant produces a fruit to deter a class of consumers that would destroy its seeds." 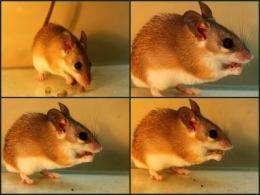 The researchers observed two other species  another spiny mouse species and a rodent named the bushy tailed jird  also spitting out sweet mignonette seeds while eating the fruit. They say the new study is the first to find seed-spitting in rodents, although it has been documented previously in several primate species. Immature berries of the Middle East desert shrub Ochradenus baccatus, also known as sweet mignonette or taily weed. If the seeds are chewed at the same time as the fruit pulp, the berries release a toxic "mustard oil bomb." A new study by Israeli and University of Utah scientists shows that toxic reaction prompts spiny mice to spit out the seeds when they eat the berries, effectively helping the plant reproduce. Credit: Michal Samuni-Blank, Technion-Israel Institute of Technology. 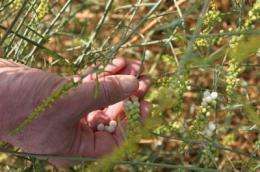 The researchers say the plant is a key species that plays a critical role in extreme deserts because it often is a focus for animal activity  providing food, water, shade and nesting sites  and sometimes serves as a "nurse plant" to help other plant species become established. Strong enough so the memory of it makes the common or Cairo spiny mouse  Acomys cahirinus  spit out most of the seeds while chewing the pulp. The new study documented that in photographs and video. The study also found the nocturnal mice will revert to eating the seeds if the mustard bomb is deactivated.